B-Movies are the best, aren’t they? Those goofy, unrealistic and completely unbelievable movies involving a completely absurd concept that no large movie studio would go anywhere near – they are truly incredible. A killer tyre? Worth making a movie from. Cheesy aliens? A prime idea. Those incredible movies do their very best to replicate big-budget thrills using only pocket change, and for that alone they’re commendable. I mention this because Earth Defense Force 4.1 is the definition of a B-Movie game – it’s got all the scale, thrills and action of its AAA cousins, but at a clearly lower budget, cheesy, low-poly enemies and the done-to-death concept of aliens invading the earth. And it’s the best B-movie I’ve ever seen. So, just to be clear, Earth Defense Force 4.1 is not a movie. 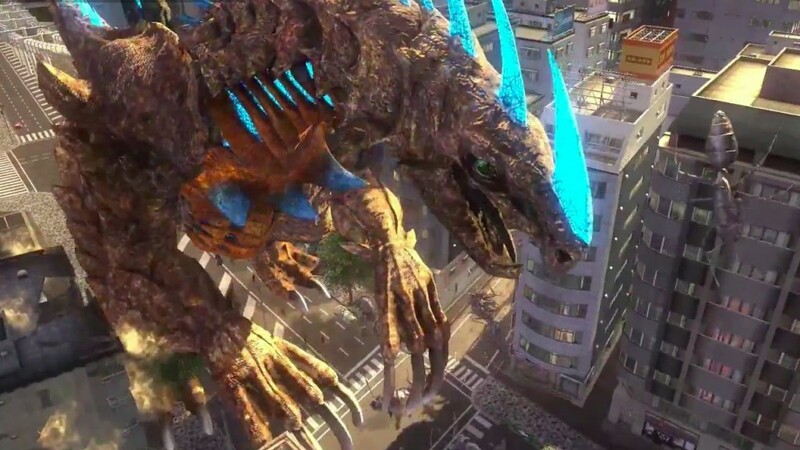 EDF is a game where you fend off alien forces from invading very Japanese towns and cities. It sounds, and looks, incredibly… Not-good. Buildings are very angular, the environments look uninspired, there’s not much detail to be found in any of the textures – even the menus were described by my friend as something that should “be in a Gamecube game” which I couldn’t help but agree with. 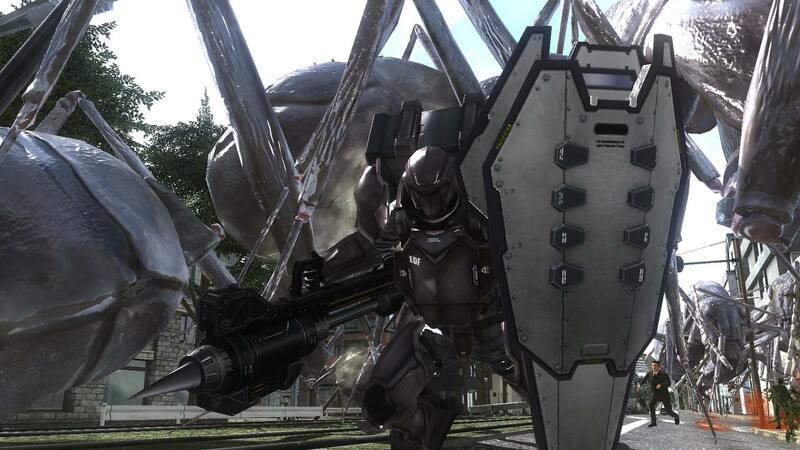 The game is a remaster of an earlier game – EDF 2025 – which is clearly noticeable from the graphics. The whole package screams either low-budget or low-effort. And it’s with great pleasure that I say that the moment-to-moment gameplay is the complete opposite – it’s definitely not low-quality, it’s genuinely good fun. When I first turned the game on I was a slow moving army man, in a very bland city, shooting very unimpressive guns. Not the best first impression. Suddenly, a flurry of red dots appears on the my radar, rants about giant insects came screeching over the radio – so I turned in the direction of these red dots and stared. It’s a horizon. A typical skyline. Houses, trees, buildings in the distance… But wait, there’s something more. Some scuffling on the horizon, small, at first, slowly becoming more and more active. Before you know it, almost the entire horizon is covered in hyperactive creepy-crawlies – and oh my god is it ever intense. Like Indiana Jones being chased by a boulder with nowhere to run to, I stood and shot all my guns, taking down hordes of the encroaching ants. Before you even know what has hit you they have completely surrounded you, on all corners – escape is unlikely, all you can really do is shoot your way out. Which, eventually, you will. It’s an incredible first impression, to be honest. When the game starts it feels sluggish, lazy, and then as soon as the storm of insects hits Earth Defense Force 4.1 changes for the best. Suddenly adrenaline starts pumping, a furious battle begins and it’s a complete thrill. Just when I thought I’d found out what makes this game so incredible, I find the other classes – more specifically my favorite, the Wing Diver. The Ranger is the standard class, heavy on firepower but low on mobility. The Air Ranger has a variety of techniques to use, such as calling in air strikes, placing explosives or even assisting the health/ammo of other soldiers. The Fencer is a heavy, and quite slow unit, with the potential for absolutely massive damage dealing – shame it can’t move as fast as you’d like it to. Then we come to the Wing Diver, the majestic Wing Diver. Whether it’s raining explosive plasma down on giant spiders or flying over hordes of ants as you individually laser them to death, the Wing Diver feels like the best part of the game by far. What the Wing Diver makes you realize is that these maps for stages are surprisingly large. You can fly to the tops of buildings, power pylons and more, looking down on the chaos the alien insects are creating. Moments like destroying alien dropships by hovering underneath them with the Wing Diver and shooting into hatches feel very satisfying. Overall, it actually makes you feel part of a large-scale battle for the survival of humankind, something that so many war and army games have failed at over and over again. Split-screen co-op is an addition which I am infinitely grateful for. Sure, the frame rate can tank, especially in the more insect-heavy scenes, but being able to fight off the alien fiends with a friend you can coordinate with is brilliant. “I’m stuck in a spider web!” I cry, as my friend assures me he’ll be over just as soon as he’s countered the ants turning a skyscraper into their nest. The insects themselves may look a bit silly and unrealistic, but in droves they can be terrifying. Jumping spiders say hello early on in the game, and their introduction is magical. Suddenly you see one jump leagues over a house, then twenty or thirty follow suit. These organic moments happen all the time, from a distance you’ll notice insects being dropped in, or approach from the other side of the map. Again, the sense of scale, urgency and the elation you get from dropping explosives on a large crowd of insects is all very, very real.